Fancy toast is definitely worth getting excited about. In this case, I’m not quite sure what I was more excited about – the fancy toast, or the French Breakfast Radishes. When I saw these at Whole Foods over the weekend, I was just like… NEED. Whole Foods is basically a produce wonderland. Some husbands sweat when their wives walk by a shoe store – not mine! My husband sweats when I’m in the produce section at Whole Foods. Tsk! Radishes always seem to heighten the aesthetics of a dish with their gorgeous fuchsia exteriors and ethereal centers. Usually I slice them really thin with my mandolin and throw them in salads for added “Wow!” factor, but with these being called French Breakfast Radishes I thought – hey, why not breakfast? On the weekends I tend to stick to my routine, but every once in a while I get a little fancy-dancy. Sometimes it’s omelettes; on the odd occasion it’s pancakes. 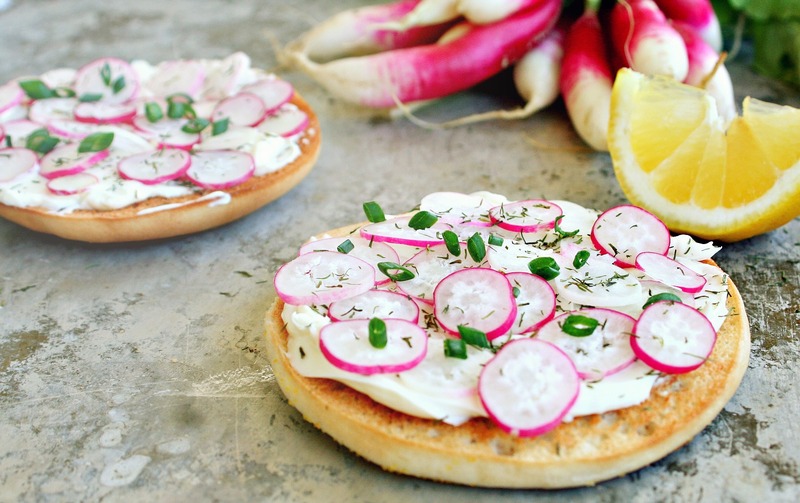 This past weekend, I opted for bagel thins with cream cheese, fresh chopped dill, French Breakfast radishes, a squeeze of fresh lemon juice, and chives. It’s really a shame that I live so far away from my Mother and Mother-in-Law, because these would have been a great addition to a Mothers Day brunch. Spread the cream cheese evenly on your toasted bagel thin. Sprinkle both halves with half of the chopped dill. Top with slices of French Breakfast Radishes. Sprinkle with the rest of the dill. Spritz lemon juice over the toasts. Those radishes, really, they are adorable! On top of cream cheese on top of a bagel, with lemon juice and dill they must have been delicious! Beautiful colors and pictures!